Today, May 12th 2017, a ransomware variant known as WanaCry is being spread on a massive scale around the world. Once a computer is infected it will attempt to infect other machines on the same network using a recently patched vulnerability in the Windows SMB protocol. Microsoft has also released a patch for Windows XP. 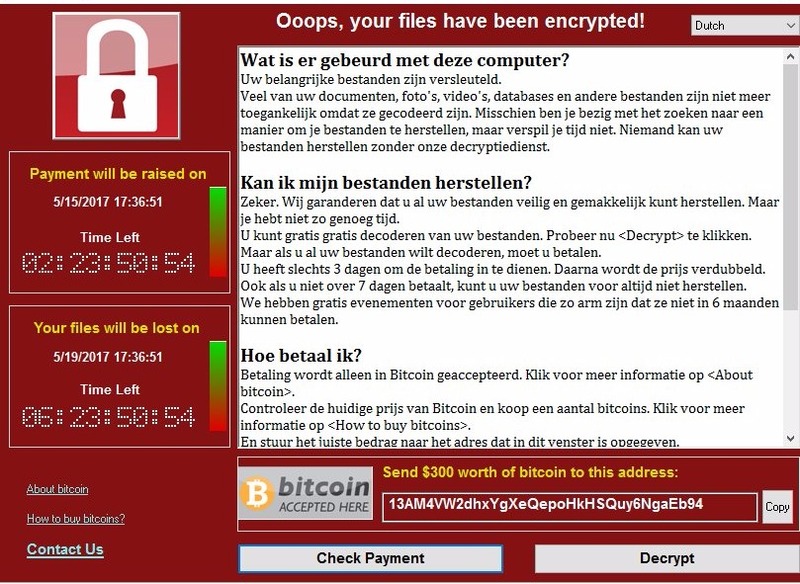 This ransomware campaign is especially dangerous as it spreads itself through the internal network using a recently patched Windows vulnerability. Once a machine is infected it will scan the entire internal network and infect vulnerable machines. Machines are not required to be connected to the internet for the encryption process to take place. The exploit used by this ransomware campaign was leaked by a group known as the ‘Shadow Brokers’ and has now been repurposed by the attackers behind this campaign to infect machines in internal networks. Microsoft has released a patch for this specific vulnerability (MS17-010) on March 14th 2017. Machines that have been patched are not vulnerable to the exploit, but could still be infected through other infection methods such as phishing e-mails. After looking at the ransomware’s code Fox-IT noticed that the malware had a hardcoded kill switch which could disable all functionality. Once the ransomware is running on a victim’s machine it tries to connect to the domain iuqerfsodp9ifjaposdfjhgosurijfaewrwergwea[.]com. If the connection succeeds, the binary exits and will not start encrypting files nor start spreading. It appears that a fellow security researcher (@MalwareTechBlog) spotted the domain and found out it was not registered by the attackers. This was a sloppy mistake by the hackers, given the large campaign it was engaged in. This security researcher has registered the domain name and as soon it was replying to requests it seems that the kill switch in the malware became active. This means that anyone who has received the actual phishing email but did not open it yet appears to have been saved. The domain seems to be registered at 17:08:04 CEST. This could be one of the possible exaplanations as to why the hardcoded Bitcoin wallets have not received a large amount of Bitcoins. The large amount of damage caused today and all international press attention have given everybody a heads up of what to expect. With the majority of the big organisations starting with their weekend, offices are closed. System administrators and security personal could use this weekend to take prevention, detection and response measures. If everyone comes back in the office by Monday and a new wave of phishing attacks would start, without a kill-switch, the damage could be far less than expected at this stage. Though we have learned a lot, the cyber criminals will have as well. The ransomware itself communicates using the Tor protocol.